Minerals extracted from eastern Congo—the ores that produce tin, tantalum, tungsten, or the 3Ts, and gold—are essential to the electronics devices we use and depend on every day. Tin is used as solder on circuit boards in every electronic device we use; tantalum stores electricity and is essential to portable electronics and high-speed processing devices; tungsten enables cell phone vibration alerts; and gold is not only made into jewelry, but is also used in the wiring of electronic devices. These minerals are central to the technologies that have allowed our culture to thrive and that drive our businesses, our communications infrastructure, our social engagement, and our national security. Despite this progress, there is still a long road ahead. The violent extraction of mineral resources continues to stoke conflict on the ground in eastern Congo, and consumers still have no way of knowing whether the products they purchase are indirectly financing the violence. Although it will take a collective effort by multiple industries to curtail the demand for conflict minerals, the impetus for such efforts will continue to arise in large part from conscious consumers. A major part of the solution will be driven down through the supply chain by responsible corporations making choices about the steps they can take with the suppliers with whom they choose to do business. Enough has engaged with industry-wide efforts, specifically the work of the Electronics Industry Citizenship Coalition/Global e-Sustainability Initiative, or EICC-GeSI Extractives Working Group, because it “aggregates the commercial leverage,” as the chief operating officer of a major electronics company told us. However, as we have observed and as this report details, absent sustained leadership from individual companies, industry-wide efforts can also lead to a lowest common denominator response incommensurate to the scale and urgency of the issue. Individual actions by companies have a critical role in buttressing industry efforts through supply chain tracing, contractual obligations, and supporting certification. Enough presents an initial ranking on the progress made by the 21 electronics companies with whom we have engaged in this survey.7 The report focuses on the efforts within the industry to address the conflict minerals issue and also assesses the response of other industries that are reliant on the 3Ts and gold. These rankings are an effort to provide consumers with the information they need to purchase responsibly, as well as a means of encouraging companies to continue to move forward in good faith. We are hopeful that as the rankings are updated in subsequent reports, scores will improve along with methodology as the process for tracing, auditing, and conflict-free certification evolves. Read the fact sheet (PDF) > "Report Ranks Electronics Companies on Conflict Minerals"
Read the detailed information behind the survey (PDF) > "Electronics Companies Ranked by Progress on Conflict Minerals"
Read the company rankings summary (PDF) > "Summary: Electronics Companies Ranked by Progress on Conflict Minerals"
1 This paper was a collaboration involving a number of Enough Project staff including John Bagwell, Aaron Hall, Sasha Lezhnev, and David Sullivan. Valuable contributions were also made by Langton Mahechani and Kyle Everett. 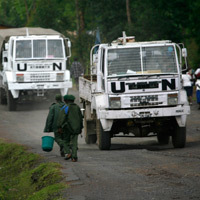 2 U.N. Security Council, “Final Report of the Group of Experts on the Democratic Republic of Congo” (2010). 3 See Enough’s recent reports on the linkages between the mineral trade and conflict in Congo, see John Prendergast, “Congo’s Enough Moment” (October 2010); Fidel Bafilemba, “Field Dispatch: Behind the Ban – An Update from Eastern Congo” (Washington: The Enough Project, 2010). 5 For U.S. legislation see Dodd-Frank Wall Street Reform and Consumer Protection Act, Public Law 111-203, 111th Cong. ( July 21, 2010), Section 1502. For U.N. action,see U.N. Security Council Resolution 1952 (2010). 6 For industry initiatives, see Prendergast, “Congo’s Enough Moment,” and Estelle Levin, “Mineral Certification Schemes in the Great Lakes Region: A Comparative Analysis,” (Burundi: Executive Secretariat of the International Conference on the Great Lakes Region, 2010). 7 One additional company, AMD, receives an honorable mention. They were not ranked as part of this survey because of our focus on the firms with major consumer electronic products, but as a chip manufacturer, they have been active in several conflict minerals issue areas. AMD has been a member of the EICC-GeSI Extractives Working Group from the outset, and they co-chaired a multi-stakeholder working group with Enough in 2010 to develop recommended guidelines on implementation of the Dodd-Frank legislation on conflict minerals. AMD has also held several meetings with it’s suppliers of components that include the four conflict minerals, and they plan to continue to work with suppliers over the coming year. AMD will be included in subsequent surveys.